The Webstone Isolator EXP E2 Lead-free Isolation Valve Kit for All Bosch Gas Tankless Water Heaters (44443WPR) comes with separate hot and cold isolation valves and a Pressure Relief Valve. Easy two-step installation of your tankless water heater with unsurpassed safety, features and benefits. This is a complete inlet/outlet valve system that provides everything you need for a secure installation, including full port testing and flushing of the system with easy-to-install union connections. Convenient two-step color coded union connections. This product is intended for use with all of our indoor and outdoor tankless water heaters. 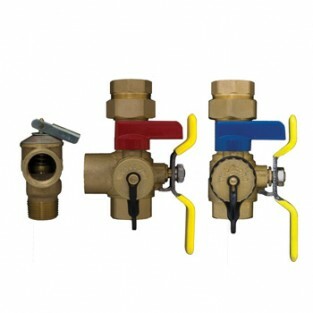 The Webstone 44443WPR Isolation valves are a set of Hot & Cold Full Port Forged Brass Ball Valves w/ Hi_Flow Hose Drains & Pressure Relief Valve Outlet 3/4" IPS Union x 3/4" IPS (500 WOG) & PRESSURE RELIEF VALVE (150 PSI/200K BTU) ISO 9001. Webstone Company, Inc. warrants all of its products to be free from manufacturing defects in material and/or workmanship for the life of the product provided they are professionally installed and operated under normal conditions. Webstone will replace, FREE OF CHARGE, any product or part thereof that proves defective in material and/or workmanship under normal installation, use and service. Webstone will also reimburse the installing contractor $50.00 to help cover the cost of replacing any of our ISO valves found to be defective in material and/or workmanship. Contact Webstone for complete details.